Last week after bringing home some furniture from Michael's grandparents house, I found the amazing fern-print paper (shown above) in a drawer. Too awesome to be a drawer liner, I've been searching for some amazing 60s goodness to transform it into something new. 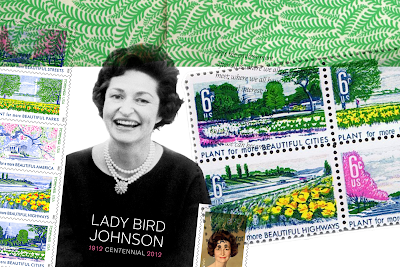 To make things even better, I discovered that they have remade a set of Lady Bird Johnson vintage stamps. Match made in heaven.